The focus of the research project was to investigate how the measurement and analysis of customer-perceived quality of the product can enhance the product brand value even before it ships. After three years of studies, Sigma Technology together with Linnaeus University have presented the information quality model and analysis tool, which makes automated information quality assessments a reality. 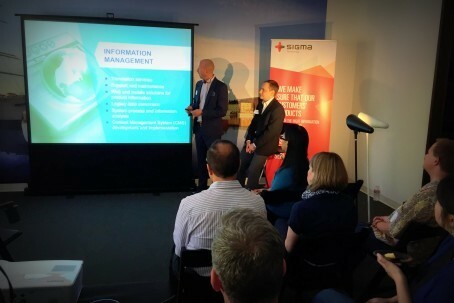 Johan Thornadtsson, Head of Operational Excellence at Sigma Technology Group, shared Sigma Technology’s forecast on the future of product information in relation to the research project, while Welf Löwe, professor in Computer Science at Linnaeus University, discussed the impressive results of the research project. The model and the tool can be used continuously, even for daily measurements, to enable testing and measuring of large sets of information. This kind of analysis is difficult, if possible at all, to perform manually within a decent time frame. Quality Monitor, the tool used in the research project, is developed by Softwerk AB. The tool can measure and visualize quality of both documentation and software and it can find quality trends over versions of documentation and software. Eddie Freij, CEO at Softwerk AB, also participated in the event. “We are very proud of this tool and we do believe it offers great benefits to the companies to enhance their product value,” shares Niklas Börjesson, President of Sigma Technology USA. During the seminar attendees had the possibility to evaluate the tool in practice. Several samples of product information were assessed using the quality tool and were then analyzed by the company’s experts.